Have you ever thought about going into marital and family therapy? If you have, you need to take — and pass — the Marital and Family Therapy (MFT) exam, which is sponsored by the Association of Marital and Family Therapy Regulatory Boards. The association’s standardized test helps state boards determine whether candidates have attained the necessary knowledge to work in an entry-level position in the marital and family therapy field. The U.S. Department of Labor projects jobs in this field to grow 23 percent nationwide through 2026, so it could be a good time to take the test. Can anyone take the Marital and Family Therapy test? No. You must meet certain education and experience requirements that vary by state, so please check with your state licensing board. The state board will send you a letter granting approval to take the exam. It costs $355 to take the test, and the fee must be paid with a major credit card. The test fee is non-refundable. What if I must change my exam date for the Marital and Family Therapy test? You can change your test date, but if it’s outside your original test window, there is a one-time rescheduling fee of $160. Can I find a testing center near me? There are hundreds of testing centers across the United States, so there should be one convenient to you. You must bring a current driver’s license, passport, or military ID to the center. Candidates who fail to bring the proper identification will not be allowed to take the test. Can I bring electronic devices in the testing room? No. Anything that can be used to record or transmit audio or video, including cell phones and tablets, are prohibited. Watches are also prohibited. What else should I leave behind when taking the Marital and Family Therapy test? Bulky clothes, such as jackets, sweatshirts, hats, and coats, are prohibited. You also can’t bring papers, books, or reference materials into the room. Can I bring a calculator in the testing room? Simple, non-programmable calculators are allowed, though a calculator is available on your computer screen. Will there be a tutorial before the test begins? Yes. The tutorial lasts five to 10 minutes. It explains how to select answers and go from question to question. Candidates may re-take the tutorial if they like. Tutorial time does not count against test time. The test has six domain areas. We describe them here, with the percentage of test questions in parenthesis. Designing and conduit treatment (24.5%) — Focuses on developing a treatment plan, when to terminate treatment, and more. The practice of systemic therapy (24%) — Focuses on theory and perspective in a practice setting. Assessing, hypothesizing, and diagnosing (15.5%) — Focuses on diagnostic methods involving client and family to guide therapy. Maintaining ethical, legal. and professional standards (14%) — Tasks involving legal and ethical codes are covered here. Evaluating ongoing process and terminating treatment (12%) — Use theory and research to make evaluations, terminating therapeutic relationships, and more. Managing crisis situations (10%) — Focuses on handling emergency situations. There are 200 questions on the test. How long do I have to finish the Marital and Family Therapy test? Can I leave the room during the exam? You can only leave to use the restroom. Anything else is prohibited. You’ll receive test results within 20 business days following the close of the testing period. Can I re-take the Marital and Family Therapy exam? Yes. You may retake the exam up to three-time in a 12-month period. The $365 exam fee will apply. If I fail the test, how long do I have to wait to re-take it? Three months, which would be the next available testing period. Clearly, you need to prepare for this big step with a quality set of tools that can help you prepare for, and pass, the exam. That’s where Mometrix’s quality set of study guides and flashcards come in. Our comprehensive study guide has been researched by a team of professionals with years of experience helping educators prepare for exams just like this one. The guide provides specifics on how to tackle the questions you’ll be asked, and if you’re stumped, you can ask one of our experts for help. Our large, easy-to-read flashcards help you learn through repetition, and the questions cover every content area of the exam. Not only that, the cards make it easy for a friend or relative to help quiz you on the questions you’ll need to know to pass the Marital and Family Therapy exam. Both the study guide and flashcards contain important bonuses for your preparation — Marital and Family Therapy practice test questions that will help you test your knowledge on the topics you’ll face; a method to maximize flashcard learning; study secrets to get the highest score possible; and ways to overcome test anxiety. Mometrix Academy is a completely free MFT exam prep resource provided by Mometrix Test Preparation. If you find benefit from our efforts here, check out our premium quality MFT study guide to take your studying to the next level. Just click the MFT study guide link below. Your purchase also helps us make even more great, free content for test-takers. Our customers love the tutorial videos from Mometrix Academy that we have incorporated into our MFT test study guide. The MFT study guide reviews below are examples of customer experiences. Excellent for helping studying for the test. This study is super close to the test format and especially with how the questions are stated, such as in the verbage used and how the test will use a case study and ask 4-5 questions with it. It was light to carry around and the prep tests are very nicely made. And I passed the test after studying with this guide. I purchased MFT Exam Secrets Study Guide, on the recommendation of a fellow therapist who used only this method, with minimal studying, and aced their MFT National Exam recently. I picked it because I saw in her copy the full explanations in the back for each right answer. This is how I think I will learn best, and I need to be efficient with my time and money as I complete my internship, graduate, and prepare for this important exam. Your book is just the right length – not too long or too short. I’m excited to dive in! 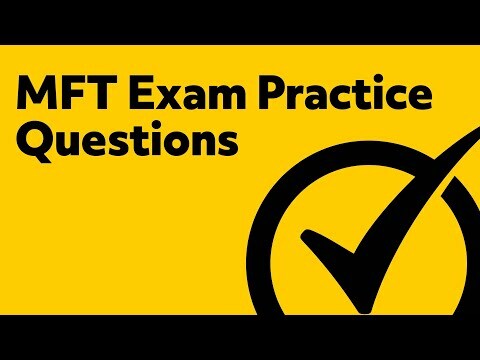 I’ve taken the MFT exam before and was looking for a different approach to studying this time around. The information in this study guide is concise and easy to understand. The tips in the front if the workbook are helpful too. So far I am really impressed with this product, especially the complete practice test and the answers. It is so good to have all the information I need in one place rather than getting lost reading through complete text books. It is interesting that you have given some really dense information, like you have noted the essential bits for me. So far my experience with this material is positive and helpful. I was using other books and they had too much information. What I like about Mometrix’s study material is how concise and to the point this material is. 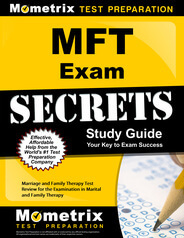 I purchased MFT study guide for the Marriage and family therapy licensing exam and I absolutely love it. I rate it as a 5. It has a lot of information and is not overwhelming for all the material it covers. I would recommend it to anyone. I found this product very helpful and my rating goes all the way to the top in a scale of 5. I am delighted with the product, I found extremely interesting the chapter dedicated to the “Neuromuscular and Nervous Systems”. That’s is a complicated topic and the way it is structured in the book made it easy for me to go through it . I found order and I found sequence in my way of learning and preparing for my ultimate test. I was impressed by the amount of study materials provided. The size of the font is awesome and easy to read. There is ample room on the pages to write notes in the white spaces. My needs have been met by the exam study guide because it is comprehensive and covers a massive amount of material.